If you're making Altamont, Kansas your vacation destination or just passing through, we welcome you to stay for a while and visit one or two of our interesting attractions , such as the Louie P Gartner Recreation Area Or perhaps your timing is just perfect to take part in an exciting event. We know you'll enjoy the Junk In The Trunk . Altamont began with a single frame building (post office) and a dirt "main street" with approximately 200 citizens. Through the years, a railroad station, livery stable, blacksmith shops, the town well, and a hotel were added. Business was conducted mainly on credit, and when a customer paid his bill, he always received a free sack of candy whether it be licorice, hard candy, or cinnamon drops at the local general store. Restrooms were, of course, the privy outside the back room. Altamont's strong religious heritage started with the Presbyterian Church with records dating back to March 20, 1880 with a membership of 94 persons. Church was well attended by residents of Altamont and from the rural area surrounding Altamont. On September 14, 1892, the new schoolhouse was opened with an attendance of 18 boys and 15 girls. The charge was $2.00 a month. 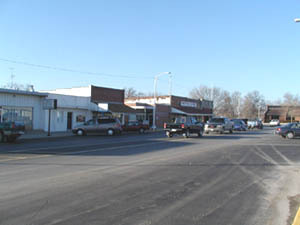 A special act was passed by the state legislature in 1893 which provided for the establishment of a county high school to be located in Altamont, Kansas. Three courses were offered to the students which included normal training, a general course, and a college preparatory course.